I hired a rig off of Diego which was old but solid. I ground-handled for some of the morning which was enough to get to the feel of the wing and packed up hurriedly when everyone looked ready for the off. The weather was big, cumulus clouds building, but this could create weather too big for flight so we knew we had to hurry. The van was packed full on the way to the take-off point. I sat in the back with Alejandro who has a great sense of humour and we laughed our way up the hill. The wind was a little twitchy, changing directions rapidly, which spooked a few of the pilots a little. Cache also dumped into a bush on take-off, an indication that the lift was not as it should be, but in our enthusiasm to get to those big fluffy clouds I followed Diego and took-off after helping Cache get his wing out of the bush. My flight was great, although It was suggested that I head down the hill rather than look for thermals, Martin was starting to suspect something was wrong. Mariella couldn’t see Diego coming over the hill as he should have done, he had headed up the valley in the direction of the paragliding centre which was also the direction the bad weather was coming from. I’m not sure that anyone knows what happened, but Diego was found dead high up on the side of a cliff. I only knew Diego for an evening, we talked of his job as a map maker, using satellite information to make his job easier. He was a lovely fella, good humoured and easy going like most paragliding people I have met. I hope he’s having fun flying amongst those stars of his. So it was decided that those of us staying at the centre would leave and make way for the family to grieve. We went into town and got a place for the night, for three of us pilots and two girlfriends. We toasted many drinks to Diego. The next day I went back to my old haunt, The Refugio Patagonico and found out, to my surprise, that it was new year. The New Year party was as good as the Christmas one. I had met a few Irish lasses and we cooked up a chicken which we ate outside, sharing with everyone else who had cooked up their own meals of goat etc. The party went on well into the next day. After a few recover days I made a quick decision to join a few Israeli’s who were on their way into the mountains for a walk. 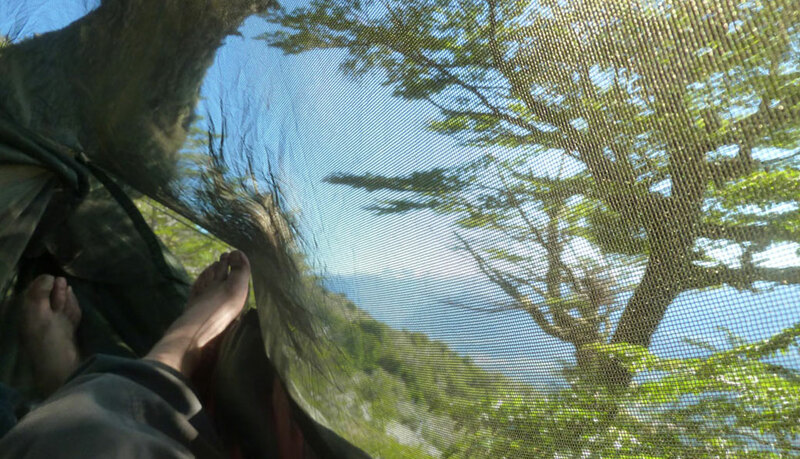 I ended up staying 6 days amongst those wonderful Andean peaks going from Refugio to Refugio. I needed the peace after what happened to Diego in El Bolson, I thought a lot about him and what had happened as I walked around those mountains. The system of Refugio is one of the golden finds on this wonderful continent. What they are is a string of Refuges that allow you to walk amongst the mountains with nothing but the most basic of equipment as they have sleeping accommodation. If you want to camp you can and I had packed my hammock and a sleeping bag to sleep in. Los Playitas, Cajon Azul, Los Lagitos, Retamal, Natacion, Hiello Azul. As I said each has it’s own character, and due to the nature of the refugios I started to think of them as something out of a Western Film. Los Playitas a little masic, few feminine touches like the house of a bachelor. Welcoming, but no frills. Cajon Azul was the High Chaparral of Refugios, organised, the kind of place you’d expect to organise law and order in the area. Retamal was a bit of a hippy hangout, more easy rider than Western genre, then Los Lagitos, with it’s lusty landlady Sylvia who waves her ample bosom at you whilst chatting about the absence of her husband, well we’ll leave that one to your imagination. The high points of the walk were the wonderful Cajon Azul (blue canyon) and the sheer scale of the mountains. I felt such an inner peace ofter spending time there, rather than sapping energy I felt energised. Now I’m South if El Bolson in a place called Esquel, not sure why as El Bolson was simply wonderful. I’ll go back there one day, perhaps to fly again with the paragliding crew there and make another toast to Diego. Greetings . I enjoy this site just now. I for sure enjoy looking at the blog posts. I am about to add to favorites. Thanks for writing. I discovered this site through bing. Good to find that the engine knows how to find excellent websites and not horrible blogs. Have a great new years!!! Sounds great Tobes, I’d like you to show me the ropes with a snowboard sometime as the only time I tried it was on icy artificial snow. Fondue eating is good fun too, the Swiss know how to warm up a winter don’t they – people are not so clued up about the cold in The UK, it’s like we never had a winter before every year. Big denial methinks. Where are you doing the boarding and fondue eating? And to you Jene, a very polite bit of spam, you can stay for that. I am a PhD student undertaking a research on global nomads, if you are interested in participating all it takes is a 40mins call via Skype, and/or the permission to use the textual information in your website (which can be anonymous or referenced accordingly). My email is gabbygn@hotmail.co.uk if you would like more information.